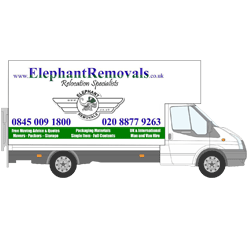 Elephant Removals Company provides professional Man and Van in London to make it cheap and affordable for students and Londoners with small to medium haulage needs. Flexibility with best value makes us fast growing and one of the trusted leading man and van service operating in the Greater London City. Our great reputation with high standards indicates that our movers strive for better and keep our precious customers happy whether moving home, or office relocation from any part of London or across the United Kingdom. We operate Man with a Van service with dignity and our beliefs to do good job have made us become London's reliable and a Hart-Winning Man and Van Company unparalleled in the man with a van transport and shipping industry. 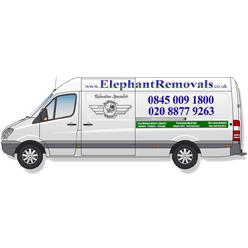 Our Man with a Van in London service covers areas around M25 at an affordable discount rate. Discover amazing jaw dropping prices and save with expert Van plus Man Service for complete peace of mind with London's favourite and trusted moving company. Van and Man Service in London is a perfect solution for a single item relocation or small light moves and with more men added, for all your moving needs. Hire a Man and Van Service from a legitimate trusted registered moving company for house removals or office moves 7 days a week. Van plus man = happy move. Our Man and Van Prices have made us become the favourite Man and Van Rental London Co with no Hidden Charges. Complete goods transport and shipping solutions with reliable removal van and a strong gentleman, specialists with over 15 years relocation experience. Our Man Van London Service keeps London Moving 24/7. Our transparent prices include all taxes with No premium charges in the evenings or the weekends. Please note that we operate on a first come, first serve basis, try to book sooner rather than later to avoid any disappointments. For journeys going outside London etc. will possibly be more to cover the excess fuel and other relavent costs. Our Man with a Van in London service consists of fully-equipped vehicles with SatNav, GPs Tracking system, removal blankets, railings, straps and special four wheel trolley which can carry up to 9 boxes at a time which can be handled by one man with a van. Don't delay and call today, to experience a wonderful day! Why hire our Man Van London service? We are a professional, reputable, registered, and also Tax listed company, therefore comparing our services to a man and van person would be an injustice to us. Many in the field are unpunctual (late), unreliable (may not come at all), uninsured, unregistered, inexperienced, have smaller vehicle (more trips), not fully equipped and some are even opportunists, who can run away with your goods as you sometimes hear in the Local News, Click Here for more info on just one of the most famous heartbreaking stories. For 17.5 Tonne and over, please contact us with clear requirements. Read reviews and ratings by genuine clients as a direct feedback!